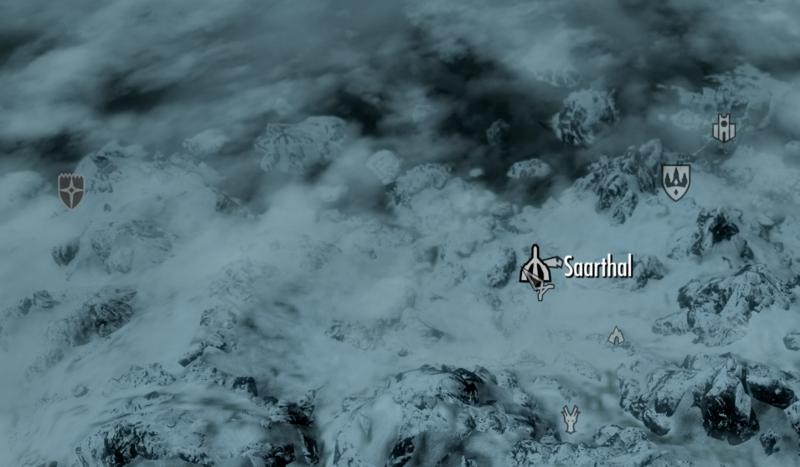 This image shows the location of Saarthal compared to the major villages in Skyrim. Early on after you have found Arniel Gane you will have to pick an amulet from the wall. It will cause the gate behind you to close and Tofdir will ask you to figure out how to open the gate again. Simply equip the amulet. If you then turn towards the wall that you took the amulet from you will see something like fire coming out of it. Use fire destruction magic on the door to finish solving the puzzle which will blast the door out of the way. 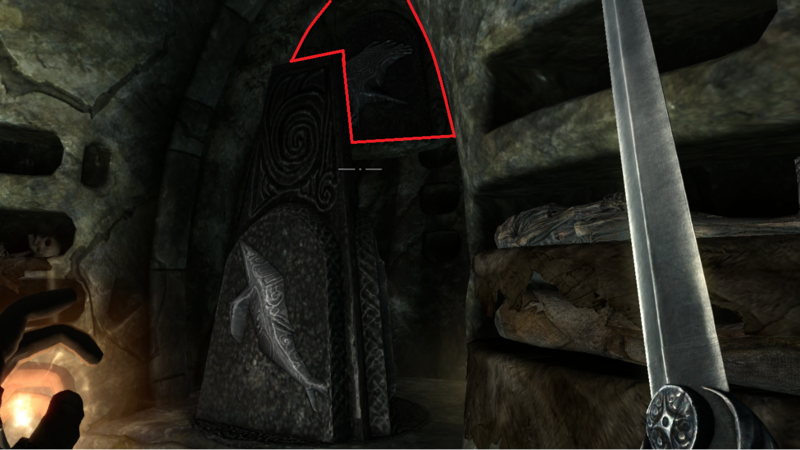 This image shows the solution to the first animal puzzle in Saarthal. Change the right row of pillars to an eagle for the first, snake for the second and fish for the third pillar. Change the left row of pillars to a fish for the first, eagle for the second and third pillar. The second animal puzzle also shows the solution symbols above and behind the pillars. However some of the pillars turn some of the other pillars. The left pillar of the set that is closest to the lowered gate turns all other pillars as well. Set that pillar to fish first. The next pillar is the left of the set that is furthest away from the lowered gate, it will turn both of the left pillars. Set this one to snake next. Next you will have to set the right pillar that is closest to the gate to eagle and the last pillar to fish. Pull the lever to raise the gate. Tofdir will tell you to keep him busy whilst he uses destruction magic to damage the magicka of the orb. Jyrik doesn’t do much damage so I decided to tank that damage. You will quickly be able to kill him after the enchantment on him breaks. This entry was posted in College of Winterhold Quests, Skyrim and tagged easy, fast, guide, help, how to, howto, master, quick, saarthal, skyrim, tips, tricks, undersaarthal, walkthrough. Bookmark the permalink.